India’s most popular and cheapest electric car Mahindra e2o was found in new Avatar – with 4 doors. The company seem to be working hard to bring a 4-door version of its electric car, the e2o, to Indian car market. The existing e2o is a 2-door, four-seat, all-electric city car which is produced Reva Electric Car Company, the company which is now a part of Mahindra. Various other automotive portals had already predicted that Mahindra would be bringing the four-door variant of the e2o. 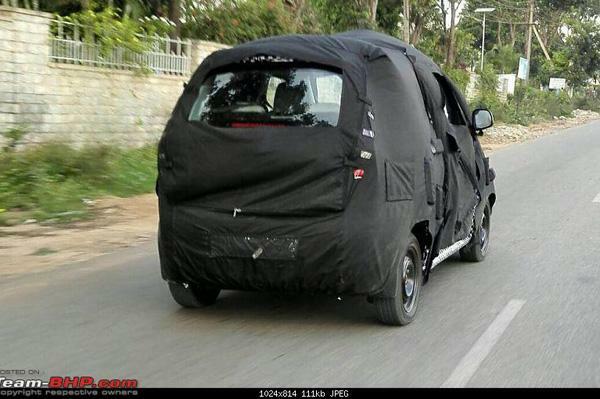 The 4-door Mahindra e2o electric car was first spotted testing on Bangalore-Hosur highway . The spotted Mahindra e2o car gets a vertically stacked tail-lamps, exactly in the place of the 2-door’s wrap-around units. The four-door Mahindra e2o would also get an all-new and practical tailgate design. The Mahindra e2o test car as seen in the above picture appears to have a very longer wheelbase than its 2-door sibling, providing more space in the car’s cabin. The Mahindra e2o is very likely getting other styling changes as well, although most of its components are pretty much same in the two-door sibling. Under the hood, the 4-door Mahindra e2o is expected to get an identical 2-door in terms of range and running gear. But there are also rumours and news from Mahindra that the company is working on developing updated mechanical components and battery which would offer even more range. The 4-door Mahindra e2o can even enter the global market. The addition of 4-door Mahindra e2o to the all-electric portfolio further boosts the sales of its all-electric hatchback, as 2-door cars in this segment are not so well received by buyers who are in search of comfortable and practical 4-door hatchbacks.